Magaldi Industrie founded in 1929 in Salerno, is a leading manufacturer of industrial systems and plants for bulk material handling at high temperatures in coal-fired power plants, cement industries, waste ash plants, steel plants, foundries and metal refining plants. Magaldi's mission is to design, manufacture and market reliable, high-quality systems that provide environmentally sustainable industrial solutions worldwide. The company philosophy is based on the concept “Dependable Technologies”, meaning constant reliability over time. The confirmation comes from a large number of foundries that have adopted the patented steel belt conveyor, known as Magaldi Superbelt®. Hot Sand transportation and cooling. 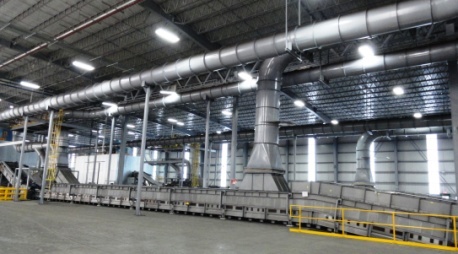 The Magaldi Superbelt® “PR type” has been designed without sidewalls to facilitate sorting and degating operations. The Magaldi Superbelt® “PZ type” is based on the Superbelt® "P type”, adding a belt surface without steps in the overlapping area of the pans. 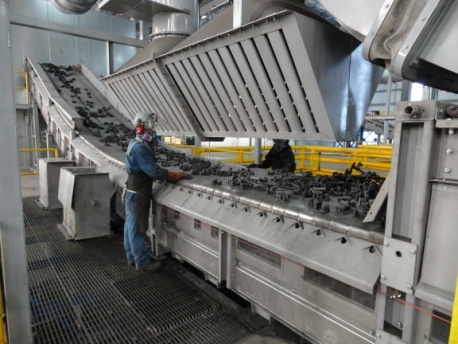 The MCC® is designed to offer handling and cooling of castings and to assure maximum productivity. The Magaldi Ecobelt® is the latest state of the art conveyor for handling hot materials, aggressive chemicals, heavy or sharp products. It is designed completely enclosed in a steel casing to prevent dust dispersion to the environment.